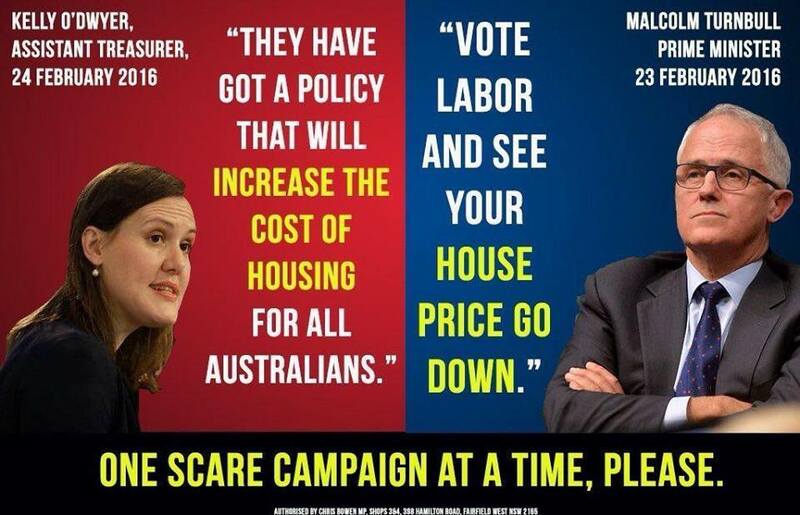 "What they're saying is warning that Bill Shorten's reckless and dangerous experiment with the largest asset class in Australia will drive down home values and drive up rents," Mr Turnbull said. From the outset it must be stated that this is a hyperbolic and even wicked fear campaign, built on an obvious contradiction, and one which is already been called out. It is implausible have a situation where house prices are going down and rent prices are going up. If house prices go down, rents go down as well, and vice-versa. Former treasurer, Joe Hockey, had already made the claim that changing negative gearing would push up rents, and it's clear that the empirical evidence does not support that claim. What the abolition of negative gearing on existing properties will actually do is redirect some investment to new properties. This means a slight increase of housing supply, which will reduce rents and house prices. Overall, the Grattan Institute, in reviewing the proposed changes, noted that the overall effect would be a two percent reduction in house prices, even if the mix of investment is changed. Negative gearing allows an investor to acquire a property (new or existing) and to claim any net losses against other income. This is unlike normal income tax claims where losses are limited to the income received. For the investor, invariably true expectation is that the capital gain of the property will exceed the accumulated losses of holding the investment. Unsurprisingly, for those who can afford it (the investor must be able to fund the loss), this has provided a very tempting opportunity. This is not lower-income investors - whilst they will claim property deductions they do not negatively gear. Those who have employed negative gearing are invariably from already high-income households; they get to keep the asset, distribute the losses, and make a profit at the end - all without necessarily putting a single extra house on the market. 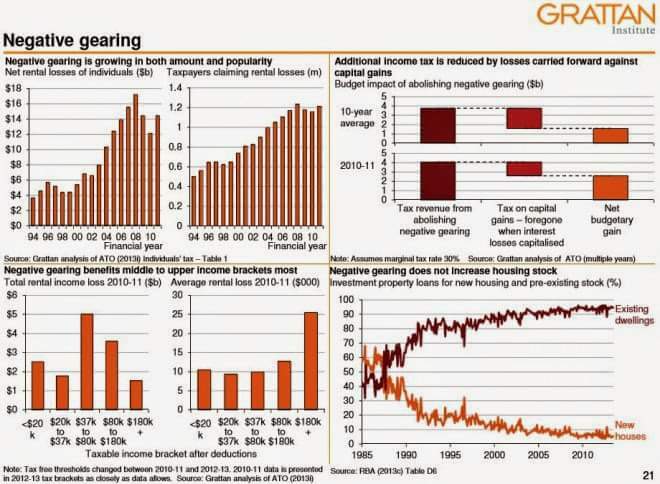 These losses to public income have be absorbed somewhere - a review of the 2013-2014 financial year revealed that the Australian government loses $3.646 billion due to negative gearing. The 1.2 million who negative gear receive a subsidy of approximately $310 per annum from the 11.7 million of taxpayers who don't. The treasurer, contradicting the Parliamentary Budget Office, naturally enough disagrees, and again engages in the delightful contradiction by claiming it won't save much public money, but it will cost investor money. It is not as if this train-wreck of a policy has not caught the attention of policy developers for some years. The Grattan Institute has noted that the abolition of the income tax deduction and halve the 50 per cent capital gains tax discount could save the government a neat $5 billion in taxes. Internal analysis by Reserve Bank, released under Freedom of Information, noted that the existing arrangements had led to high levels of property speculation and the generation of a housing bubble - the sort of thing which keeps these people up at night with worry. Even from the government itself, Liberal MP John Alexander led an inquiry into affordability, told Four Corners negative gearing has led to a housing market "dominated by speculative investors", that was driving people out of home ownership. Monash University's Centre of Population and Urban Research declared the current policy a social catasrophe, a postition to which The Economist agreed:. The crazy practice of "negative gearing", which allows investors in property to write nearly everything off against tax, has also helped push up prices beyond the reach of Australians in their 20s and 30s (many of whom, even if they are able to buy a property, still have to live with their parents to afford it). If multiple studies makes it abundantly clear that Australia's current negative gearing practises are "crazy", "dominated by speculative interests", "a social catastrophe", are contrary to the needs of financial stability, are costing tax payers billions of dollars - then who in their right mind would oppose changes that would improve this situation? The answer of course is vested interests, very vested interests, of a particular economic class, mostly of a particular level of income, and mostly of a particular political orientation - the same sort of people who would seriously argue that the removal of a 'welfare-for-the-rich" rort is seriously an attack on economic freedom. One cannot help but admire their chutzpah. It was once argued that negative gearing would improve housing supply; the argument went if people were able to negatively gear an investment property that would result in more properties being built. To an extent this is true, when new houses are built. But it has also created a perverse incentive for artificial scarcity and an oversupply problem - real estate prices have skyrocketed, incomes have only increased at around half the rate, and the result is debt for those who buy, and lower-rates of home ownership (leading to ridiculous intergenerational territory, a collapse in housing affordability, and property sales the end up in the macabre territory. For their part, real estate agents put it quite simply, with no sense of compunction: Simply put: the tax man [read: other tax payers] and the rental income pays for your investment property. Not surprising really from an industry that is notorious for being untrustworthy. The treasurer simply and deliberately promotes arguments which he surely most know simply aren't true. But then again, he is arguably just protecting the very vested interests of his most immediate colleagues. The proposed policy from the Labor Party is actually quite modest and pragmatic. The reaction from the landlord class and their shills in the Liberal Party and the real-estate profession is surprising in the degree that they've squealed. It's a far cry from the German model, that avoids boom-bust land-banking cycles - whereas other parts of the world see increased capital accumulation by the already wealthy through land ownership. But of course, for the landlord class - not those that necessarily rent houses, but those who receive unearned income from land ownership - they will protect their feudal privilege through any means necessary. Commenting on this Page will be automatically closed on July 17, 2016. Malcolm Turnbull is repeating claims that have already been proven to be false. Well obviously there's a huge need for proper regulatory measures to be put into place on the property market right now as we are seeing these trends come into play. It's not that difficult to impose something on the market if it's for the benefit of the people isn't it. Short of people all downsizing into tiny houses and living off their belongings in self storage, which I don't think the general public would like, I don't think that there'll be much other option for people if something about supply and costs of homes doesn't improve! Turns out that Treasury documents told a different story to the government spin.